One of the great things about this infused water is that you can use frozen blueberries, which are far cheaper than their fresh picked counterparts. If you use frozen, however, you will need to let this water infuse at room temperature for a few hours before chilling in the fridge. The taste is divine and the pink tint of the water makes it appealing to the eyes, too. Whatever you do, go easy on the lemon as too much of it can make the water bitter. 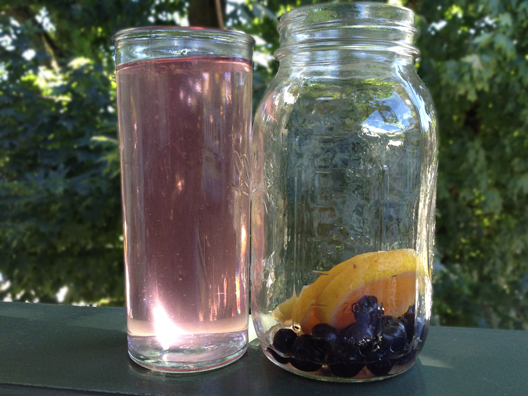 Recipe for a 32 oz Ball Jar: 2 organic orange slices + 1 organic lemon slice + 8-10 blueberries. Chill in the fridge for 4-8 hours and up to 24 hours for maximum flavor. How long will this last in the fridge? Is it possible to make a larger batch to drink over several days? You can definitely make a larger batch to drink over a few days. When doing so, be sure to cut the rinds off of the oranges to avoid bitterness. 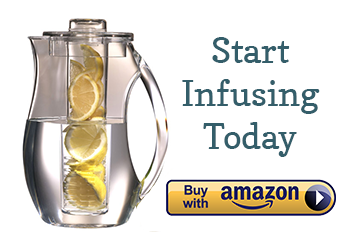 Trust me, this is an essential step in long-lasting infused waters since citrus rinds are very astringent. Also, you will see that the blueberries and oranges start to get floaters. This is fine and just a normal reaction to fruit being in water. The floaters do not look very pretty, but they are not bad for you. Final tip: don’t drink the water after three days. Two days is best. Just like cutting open an apple and putting it in your fridge, infused fruits start to lose flavor and will naturally start to disintegrate after about 24 hours. Do I need to leave the water outside of refrigeration? I made this recipe but put in the icebox. I have very little blue berry color or flavor? I did this exactly as it said. however I also didn’t get any color or flavor from the blueberries. I wonder if it would work better to cut the berries in half first? That’s interesting – the last two posts say there is little or no color. And we just did ours here – it’s very purple… Actually googled it to determine if frozen was possible. If you want the color – beat them up, but as the article reads – “juice = different flavor” and logic tells me the color comes from the juice! Hmmm well hope it’s good! I want to start doing different infusioned waters to get back healthly. Could you please send or post some to detox and I am trying to get out of the range of pre-diabetes and want to be the best I can be! Thank you for all your help! So…I’m a lil confused. Do I leave the rinds on the lemon and orange or cut them off? The picture shows them on but in 1 email response you suggested cutting them off. Love you recipes. Looking forward to more.